Bats Day 2008 - Our First!, originally uploaded by kimncris. Sidenote: When I went to see The Cure, Siouxsie Sioux opened (in more ways than one). She was wearing nought but a leather jacket and a g-string, which broke halfway through her set. She didn't even notice and just carried on singing. Oh hey - That's me! (the "kim" half of kimncris). The site is lots of fun, and thanks for featuring us. In defense of my umbrella, however, I just wanted to let you know that I'm dressed as the character Death from Neil Gaiman's Sandman comics - hence, the regular umbrella. 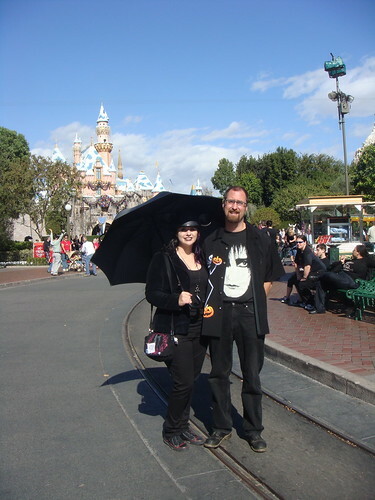 I thought Death would enjoy Disneyland, so I put together the outfit in her honor. Extraordinary Siouxsie anecdote - when was this? Dates and locations pleeeease. I was just popping over to say the exact thing KKnight said. The lady is clearly dressed as Neil Gaiman's Death. The man beside her is wearing a Death t-shirt. No Siouxsie need apply. Wow. I was wondering when photos from my event was going to start popping up here. Oh, I'm sure she noticed. She probably just didn't care.